← What’s that when it’s at home? Neotropical most iconic plant family! Bromeliads are part of our life in several different ways, especially for those who live on the American continent, where these plants firstly evolved around a hundred millions years ago (Givnish et al. 2011). Doubtless Bromeliaceae can be placed among the most iconic plant families in the Neotropics. Since the early explorers started to gather scientific data in the New World, more than 300 years ago, its astonishing diversity of life forms, habitats, odd morphological features, resilience, adaptability, ecological importance and abundance amazed those who crossed with these amazing plants in field. Historical data suggests that at least a dozen of great explorers and early botanists who come to Tropical Americas between 1800`s and 1900`s were fascinated by bromeliads. A few of them definitely are worth mention, mostly for their crucial contributions toward a broaden knowledge from one of the most unexploited region throughout the globe. Chaps such Antoine Laurent de Jussieu (who firstly scientifically described Bromeliaceae as a botanic family in 1789), Georges Cuvier (also known as the father of paleontology), the infamous explorer Alexander von Humboldt, the French naturalist Auguste de Saint-Hillarie and last but not least, the naturalist Friederich von Martius, responsible for promoting and organizing the first comprehensive work aimed to describe the vast Brazilian flora, indeed were fond of bromeliads. In the publication of the monumental book Flora Brasiliensis, Martius and his fellows dedicated many pages in an attempt to properly describe and accurately classify Bromeliaceae diversity, which they documented during several expeditions to the most remote areas of Brazil. More recently, the French explorer Édouard André, who realized many discoveries in the Andes, came to inspired several current bromeliads collectors and also contributed to enhance the knowledge on these intriguing herbs. Illustration from Flora Brasiliensis of Tillandsia sp. Typical Tropical Forest understore full of epiphytic bromelidas, aroids, palms and orchids. This magnificent flora catch the attention of many since then. Bromeliaceae is among the most well known plant families in the Neotropics, although very often new discoveries are being made, as the high number of new species described illustrates. As an enthusiast nature lover since my childhood, bromeliads also lured me with its beauty and diversity. Fortunately I had the opportunity to grow up between two large Conservation Units in Rio de Janeiro state mountains (Organs Mountain range), where big patches of the notorious Atlantic Forest Hotspot still thriving. Coincidentally, this Hotspot is also a well-known center of diversity and endemism for Bromeliaceae, as well as a important site for its diversity and conservation, as we will see along this post. Considering the above and the recently inspiration which I had at the University of Reading`s bromeliads collection, herein I will try to address the natural history of such a charismatic group of monocots, as well as highlight its great richness and endemism rates, also addressing the urgency of effective conservation actions to save it from the verge of extinction. I believe that people in general know what a bromeliad looks like. At least regarding the most common and ornamental species, which are widely being used by landscapes architects and gardening throughout many countries across the world. At a first glance, bromeliads usually are characterized by its leafs disposition, which forms a rosette-like tank, where water usually accumulates. In fact, they are extremely diversified in terms of morphology, habit, habitat and ecological preferences. These plants are essentially a Neotropical plant family, with geographical distribution ranges coming from the states of Virginia, Texas, and California in the USA (latitude 37° N) to northern Patagonia in Argentina (latitude 44° S). Nonetheless Pitcairnia feliciana (A. Chev.) Harms & Mildbraed occurs in the West African Inselbergs of Guinea, and evidences suggest that this species reached Africa through a relatively recent long distance dispersion, which probably occurred 10 million of years (Givnish et al., 2007). It was also recently suggested hat the ancestor of Pitcairnia feliciana reached the opposite side of the Atlantic Ocean between 12 and 9.3 millions of years ago, according to a series of up to date publications by Givnish et al. (2008, 2011). Bromeliaceae is among the most diverse monocotyledons families in Neotropics with more than 56 genus and between 3086 – 3286 accepted species (Givish et al., 2011; The Plant List, 2015). As you probably can realize by now, bromeliads diversity are indeed mammoth. Despite being considered one of the most well scientifically known plant family in Americas, with a broad variety of experts, both taxonomists and ecologists, studying it in details all aspects of its existence, there is yet much to be discovered. It is almost certain that if you visit herbaria world wide, you will find in expert’s cupboards at least a few new species to be described, and certainly several of them still waiting to be found in the field, as the pictures bellow illustrates in recent surveys which I took part. Navia sp., an interesting genus from Guyana Shield and Tropical Andes. This is probably a new species from Serra do Aracá State Park, Brazilian Amazon. Billbergia sp at the Serra das Confusões National Park, Piauí, Brazl. Generally speaking, the family can be described as rosette-forming herbs or sub-shrubs, with water storage tissue in mesophyll and lepidote indumentum (APG III). Its spirally disposed leaves usually present a curved blade venation, with serrate to plain margins. The inflorescence can have multiple forms, varying from racemose to spike-like ones or even head or branched panicles. The flowers of Bromeliaceae are very eye catching: the vivid and colorful displays of mostly actinomorphic and bisexual flowers are impressive, for humans and pollinators. The fruits are usually berries or capsules, depending on each species, some of them very fleshy and juicy, as the world-wide known pineapple. The uniqueness of Bromeliaceae is also morphologically expressed within the order in which it is placed. Judd (2007) indicates that the family is the only one among Poales that has septal nectaries and inferior ovaries, what are quite a useful character used by taxonomists to split different sub-families. Recent studies also positioned the family within its own order, Bromeliales, although with not much support. These plants can vary from terrestrial herbs, rupicolous (direct upon rock’s surface or within vegetation mats on mountain slopes), epiphytes or rheophytes, adapted to many different environments and climate conditions such as those found at the sea level up to the hazards and harsh conditions found at the high peaks of the Andes mountain range. Vriesea sp. – Atlantic Rainforets at Reserva Biológica do Tinguá, RJ, Brazil. Whereas scientists, senior botanists and experts still diverging about species’ circumscriptions and genera delimitation, mainly based on recent molecular phylogenies, the family have been traditionally divided in three sub-families: Bromelioideae (~650 spp. ), Pitcairnioideae (~890 spp. ), and Tillandsioideae (~1000 spp.) (Smith & Downs, 1979). However, this classification is not monophyletic, therefore it could not be to formally accepted by the Angiosperm Phylogeny Group (APG III), the current authority in flowering plants phylogeny. Considering this controversial taxonomic classification, recent studies conduct by Givnish et al (2007; 2011) based on DNA samples from leafs tissue on hundreds of specimens showed that, in fact, what represents the former sub-familly Tillandsioidea are at least six subfamilies, and they are related to each other as follow: (Brocchinioideae, (Lindmanioideae, (Tillandsioideae, (Hechtiooideae, (Navioideae, (Pitcarnioideae, (Puyoideae, Bromelioideae))))))) (more detals see APG, III). Early estimates conducted by Jansen & Bremer (2004) indicates that the age of the crown-group in Bromeliaceae must be something around 100 million years. The recent discovery which support this previous estimate is an ancient fossil found in the Brazilian limestone rock formations which can presumably be assumed to be a member of early bromeliads. As Leme & Brown (2011) suggest in their investigations with Protoananas lucenae, dated to be around 112 million of years, this record is very likely to be the oldest putative ancestor of the plants we know nowadays, sharing similar diagnostic features with some Bromelioideae members. In contrary to this perspective, Givnish et al. (2008) indicates in their work a crown age of simply 24.9-18.4 million of years, with a much more recent diversification than previously inferred. Their work, based on molecular data, settled the path to include with high level of confidence Protoananas in a different family, Protoananaceae. The uncertainties surrounding Karatophyllum bromelioides L. D. Gómez, a related fossil found in Costa Rica, regarding aging and collection locality unfortunately do not allow further inferences concerning the evolutionary history of the family (Baresch et al., 2011). Despite controversies, it is possible to allege that the intricate molecular systematic involving the relationship within Bromeliaceae species is currently increasing the pace toward new findings and robust phylogenies, what is overwhelming! Soon or later, more accurate data will be available in order to fill the gaps we can identify in this long evolutionary history, considering the vast amount of undergoing studies with this botanic family. It is traditionally accepted that modern lineages began to diverge in South America around 19 million years, and it is likely that had firstly appeared in the Guayana Shield mountain range, northern South America and thereafter spread through the whole New World, occupying pretty much every ecosystem as we know today. The Guyana Shield is assigned by geologists as one of the most ancient and immutable geological structure on earth, and definitively played an important role on Bromeliaceae evolution, diversification and subsequent radiation. It is also among the three main centers of diversity and endemism, altogether with tropical Andes, Mexico and adjacent Central America and Southeastern Brazil and,especially within the Atlantic Rainforest Hotspot. Above, the phylogenetic reconstruction conducted by Givnish and collaborators (2007) of geographic diversification in bromeliads, based on the modern distributions of sampled species, can provided significant insights toward a comprehensive understanding of the mechanism which conducted bromeliads diversification through its evolution and adaptative radiation in different regions. As hypothesized by Benzing (2000) and corroborated by Givnish et al. (2007), the peak of bromeliads adaptative radiation might have occurred after the uplift of the northern Andes and shift of the Amazon river to its present course, and probably was facilitated by selected morphological and physiologic features, such as crassulacean acid metabolism (CAM) photosynthesis and the formation of rosettes and leaf absorptive scales. The co-evolution theory regarding Tropical bromeliads and hummingbirds seem to be accurate, and helps to understand at least one variable which could contribute to a better understanding of this both classic Neotropical groups present concomitant centers of diversity and endemism (Givnish et al., 2007). Bromeliaceae is also considered by many specialists an excellent model for co-evolution studies, as their intrinsic relationship with their pollinators demonstrate. Among the plant families, Bromeliaceae is the one with the highest diversity of pollination modes, presenting ornithophily, chiropterophily, entomophily, mixed/unspecific mechanism as well as autogamyic systems. It is interesting to note that, in parallel with bromeliads diversification, the hummingbirds also conquered the American continent, radiating at similar periods and region. Their flowers of bromeliads usually have a calyx and a corolla, and the petals, although free, are erect and form a tube. This tube-like format and the colors of the flowers provide sharp evidence on their pollination’s syndromes, as suggested by Martinelli (1994). Recent studies point out that around 1,300 species of Bromeliaceae are pollinated by member of Trochillidaeae family, common is several habitats across the American continent, such as the Andean Cloud Forests and Atlantic Rainforest in Eastern Brazil (Benzing, 2000).In contrast, a few authors suggests that just a few species of hummingbirds execute the vast majority of bromeliads pollination in sotheastern Brazil (Placentini & Varassin 2007), what is quite surprising considering its diversity. Bats are also significant pollinators, specially for plants which present nocturnal anthesis. Benzing et al. (2000) summarize many aspects of the reproductive biology of the family, and provide further literature for more comprehensive approach on this specific matter. Complimentary to what was stated above, dispersal within bromeliads is known to be usually by the ingestion of the fruits by birds or bats, with Friar birds being among the most effective ones in doing this job. Some species use abiotic factors such as wind to reach long distances dispersal, independent of animal interactions to spreadout through new areas. Moreover on this odd plant family, it is considered that Bromeliads possess specific floral features, such as herkogamy and dichogamy, which are specialized and randomly selected to prevent spontaneous self-fertilization, and therefore facilitate animal-mediated outcrossing reproductive strategies (see Benzing, 2000). Self and mixed are the most common mating systems in a large part of the family, even tough self-incompatibility systems can be generally found. Clonality is also very common and widely used by cultivators and gardeners in order to increase their production of new individuals. There are a vast array of different plant-animal interaction within Bromeliaceae, and most of them are boosted by microecosystems formed inside their tanks. As some species seems to be insectivorous (Catopsis spp. ), other ones host insectivorous plants, such as member of Lentibulariaceae familly (e.g. Utricularia nelumbifolia.). Balke et al. (2008) also indicates the plausible dependence of specialized diving beetles, which lives in the water tanks of some species of Bromeliaceae, highlighting the linked evolution patterns both biological entities probably share. It is frequently recorded that the Andean Bear (Tremarctos ornatus), the single living representation of Ursideae in South America, frequently feed from bromeliads bulb and fleshy leafs. Occasionally, they also put down the magnificent Puya raimondii inflorescence to eat it, a superb 10 meters tall narrow endemic species to a stretch of the Andes Mountain Range. Despite all appealing biological, ecological and environmental importance of bromeliads, this plants are also extremely rich in terms of potential uses by humans, since ancient times. The huge amount of vernacular names applied by locals and indigenous exemplify the close affinity between men and gravatás, one of its colloquial names. For instance, the edible fruits of pineapples (Ananas comosus L.) have been feeding old civilization such as the Aztecs and the Mayas in Central America since primordial times, just as we eat them today. The fibers from the caroá (Neoglaziovia variegata Mez), an common plant from the Brazilian Caatinga and the medicinal application from Bromelia antiacatha Bertol are widely known in traditional medicine, surely in Brazil. Aechmea magdalenae, native from Central America and also known as the pita plant has long been used for its fiber as well. But definitively the most wide-spread use of bromeliads is in architecture landscape. All over the globe it is possible to find florists selling ornamental bromeliads in their stalls, with their colorful and variegated leaves and enchanting flowering displays. Bromeliads are widely distributed in the Neotropics with at least three major center of diversity. It shows many species distributed in endangered biomes, usually with narrow endemic species and/ or with a relict distribution, making them vulnerable to current human induced or natural (stochastic events) threat. Unfortunately, such a beautiful and interesting group of plants claim attention for its self just by existing, and over-collection by impetuous collector vanished populations of the rarest ones, such as Tillandsia reclinata. which was known from a single rock outcrop in southeast Brazil and after a thorough look, could not be fund till the present date. These plants as a whole has developed a high adaptive capacity throughout its evolutionary process, and as a consequence, the vast majority of the species have naturally restricted distribution ranges, usually with small population siszes and high specificity of habitats. Combined, these three facts, together with vast human direct threats which are pacing the loss of native vegetation thus drastically changing in ecosystems process, Bromeliaceae is being carry to be among the most threatened plant family in the Neotropics, with many species unfortunately facing high risk of extinction. Considering as an example the Brazilian situation regarding endangered Bromeliads. A recent publication conducted by the Brazilian National Center for Plant Conservation – CNCFlora (Martinelli & Moraes, 2013) indicated Bromeliaceae as the second most threatened family within this country, where 202 out of 439 assessed species were placed in a category of threat (CR – Critically Endangered; EN – Endangered; VU – Vulnerable). Additionally, the authors also found out that Bromeliaceae has the higher number of species considered CR and the second higher number of species considered EN, putting it in a position for high priority conservation action implementation. It is likely that the situation in many other countries within Bromeliaceae distribution will be, sadly, similar. As the major threats, direct or indirect, will be presumably the same, slightly changing in intensity and persistence, the level of threats and therefore the pririty for action will be the also the same. Add that promote bromeliad conservation can also assure other species survival, and you will find that raise awareness and action toward effective protection of this bright plants is crucial for biodiversity conservation in Neotropics as a whole. *All pictures which were not referenced are from the authors personal gallery. Balke, M, Gómez-Zurita, J, Ribera, I, Viloria, A., Zillikens, A., Steiner, J., García, M., Hendrich, L, Vogler, AP (2008) Ancient associations of aquatic beetles and tank bromeliads in the neotropical forest canopy. Proc. National Acad. Sci. U.S.A. 105: 6356-6361. Baresch, A, Smith, JA, Winter, K, Valerio, AL, Jaramillo, C (2011) Karatophyllum bromelioides L.D. Gómez revisited: A probable fossil CAM bromeliad. American Journal of Botany, v.98 n.11: 1905-1908. Benzing DH (2000) Bromeliaceae: Profile of an Adaptative Radiation. Cambridge University Press, Cambridge, 690 pp. Crayn DM, Winter K and Smith JAC (2004) Multiple origins of crassulacean acid metabolism and the epiphytic habit in the Neotropical family Bromeliaceae. Proc Natl Acad Sci USA 101:3703-3708. Givnish TJ, Millam KC, Berry PE and Sytsma KJ (2007) Phylogeny, adaptive radiation, and historical biogeography of Bromeliaceae inferred from Ndhf sequence data. Aliso 23:3-26. 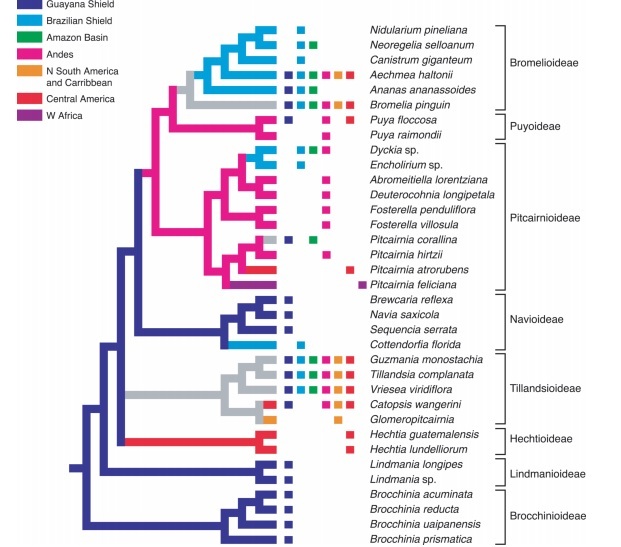 Givnish, TJ et al (2008) Pires, JC, Graham, SW, McPherson, MA, Prince, LM, & Patterson, TB (2008) Phylogeny, biogeography, and ecological evolution in Bromeliaceae: Insights from ndhF sequences. Pp. 3-26, in Columbus, J. T., Friar, E. A., Porter, J. M., Prince, L. M., & Simpson, M. G. (eds), Monocots: Comparative Biology and Evolution. Poales. Rancho Santa Ana Botanical Garden, Claremont, Ca. Aliso 23: 3-26. Givnish, TJ Barfuss MHJ, Ee BV, Riina R, Schulte K, Horres R, Gonsiska PA, Jabaily RS, Crayn DM, Smith JAC, et al (2011) Phylogeny, adaptive radiation, and historical biogeography in Bromeliaceae: Insights from an eight-locus plastid phylogeny. Am J Bot 98:872-895. Janssen, T, Bremer, K (2004) The age of major monocot groups inferred from 800+ rbcL sequences. Bot. J. Linnean Soc. 146: 385-398. Judd, WS (2007) Plant systematics, a phylogenetic approach. 3rd ed. Sunderland, MA: Sinauer Associates, Inc.
Placentini, V de Q, Varassin, IG (2007) Interaction network and the relationships between bromeliads and hummingbirds in an area of secondary Atlantic rainforest in southern Brazil. J. Trop. Ecol. 23: 663-671. Smith LB and Downs RJ (1979) Bromelioideae (Bromeliaceae). In: Flora Neotropica Monograph 14. Hafner Press, New York, pp 1658-1660. The Plant List (2013) Version 1.1. Published on the Internet; http://www.theplantlist.org/ (accessed 14th of October 2015). Brazilian biologist working with plant conservation in the Brazilian National Centre for Plant Conservation, in Rio de Janeiro Botanic Garden, since 2008. Currently conducting a MSc in Plant Diversity at the University of Reading. My main interests are within theoretical ecology, diversity, biogeography and evolution of Tropical plants. I am particularly fond of rare and distinct evolutionary lineages which are currently facing high extinction risk (http://efernandezbiophoto.wix.com/efernandez#!about/aboutPage). This entry was posted in Americas, Monocots, Neotropics and tagged Bromeliaceae, conservation, Epiphyte, MSc Plant Diversity, Tropical Crops, Tropical food plants. Bookmark the permalink.